Whether it’s the work of slicing through a rebar, or making that cut in a rod of cast iron, or maybe chopping through a steel pipe, you would definitely need a metal chop cutting saw, because other devices used for the purpose create unnecessary chaos and plus you never get that perfect job done! So while hunting for the best metal chop saw, you would definitely admire a bit of advice. This article will give you an idea of the new features emerging in the chop saw technology these days. There are many good companies manufacturing various kinds of hand tools and power tools for all kinds of manufacturing, wood, and construction industries. Here are a detailed metal chop saw reviews which will let you know in detail the various brands in the market for all such hand-held tools. For example, the Dewalt Metal Chop Saw or tools by Makita, MK Morse, and Evolution is some of the well-known tool providers in the industry. There are suitable for a multi-purpose cutting and trimming of solid woods and metals. These brands have created a mark in the field with many brilliant innovations which are making life easier for workers all around the world. Since, metal chopping is a tedious job and should be done with total safety, wearing safety glasses and saving yourself from the flying sparks is important while using them. Here, the technology and the importance of choosing the right metal chop saw for your purpose comes into play. 1 What is a Chop Saw & How it Works? What is a Chop Saw & How it Works? A Chop Saw is a hand-held machine or a power tool which is used to cut hard metals, tile surfaces or concrete for various construction tasks. It comes with an abrasive grinding disc used for performing various cutting and chopping activities. The reason behind the fact that a Metal Chop Saw is more effective than any other angle grinder or a torch is that it uses the abrasive disc for grinding heavy metals instead of a saw blade. Also, it does not have teeth, instead of a plane blade, so that the chopping is finer and the teeth do not get stuck between the metal while chopping. 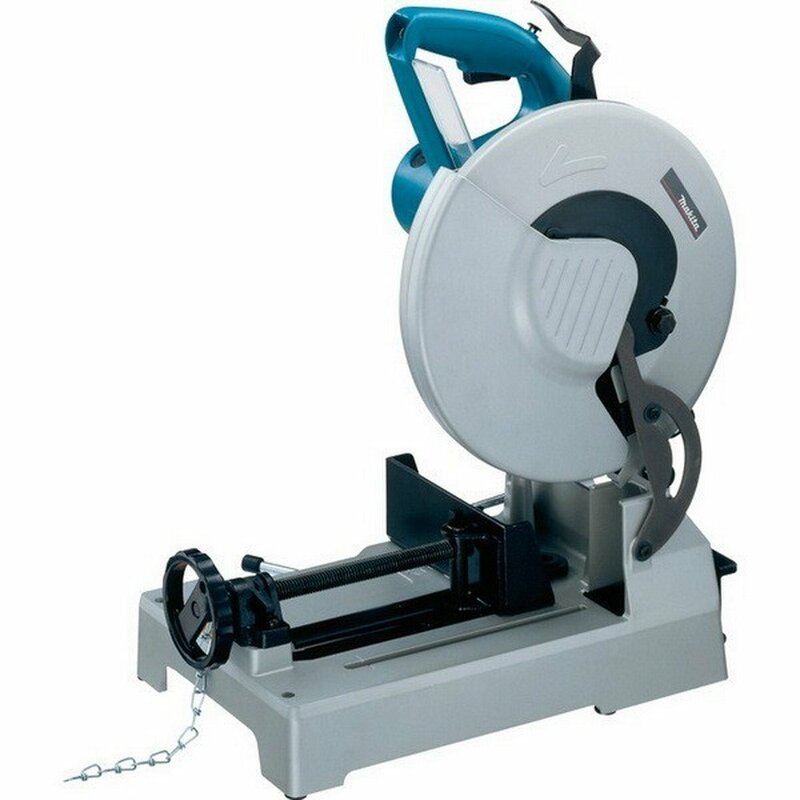 There are various types of Chop Saw models available in the market. These maybe be used on a table-top, as a free hand or walk behind models which you can drag from place to another. 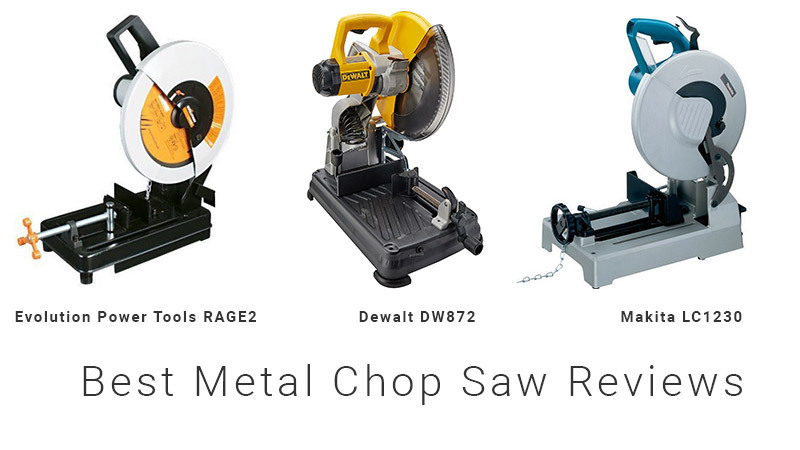 Most Metal Chop Saws are table-top models. Ever since their introduction, portable metal cutting Chop Saws, due to their light weight nature, have eased out many building jobs. Depending on the type of material these Chop Saws are being used on, these are of various forms. These are available in both corded as well as cordless varieties. There are the Miter Saws which is mainly used to cut the metal piece at a particular angle, so this is mainly used for making angular cuts. It is used for activities which require exact frame cuts to trim and mold. Then there is a jig saw which is mainly used for cutting material into curves, these are portable electric saws. Also, there is a circular saw which has a teethed disc, with a rotating wheel. Also, there is the table saw, reciprocating saw, plunge saw and many more with a whole different product line of accessories and blades. So, you might have to do a bit of research on the type of Chop Saw which would be ideal for the kind of chopping or grinding you would want to do. Looking for the best metal cutting chop saw? Here is the #1 chop saw Evolution Power Tools RAGE2. We had a bunch amount of positive review about that and it really performs great in massive work. Model number of this chop saw is RAGE 2 by Evolution and weight of the item is 46 pounds. Product dimension is 23 x 12 x 24 inches and size of the Chop Saw is 14 inches. It is a corded electrical gadget and comes in orange color. It does not operate on a battery. This is a multi-purpose cutting saw which is good for chopping plastics, steel, aluminium, and wood. It can even cut wood with embedded nails in it. You only need to use a single blade for all these purposes. It comes with fine quality 36T TCT blade combined with a hi-torque powered motor with a gearbox for accompanying requirements. It has an 1800 watts, 2.5 horse power motor. Evolution Power Tools RAGE2 does not produce any burrs, sparks, or does not have any heat build-up while gliding through tougher materials like steel. This cutting saw can slide up to 10” and can be adjusted to best suit the job. It can make faster and cleaner, and accurate cuts within minutes. Since the body of the saw stays cool while operations, it can be handled very easily. Despite being ideal for almost all kind of materials, this product also has many other attractive features. It has an in-line handle for left or right handed use. It also comes with a laser guidance system, an adjustable cutting depth for grooving, and a solid outer casing, which provides additional durability to the product. The model number is DW872 by Dewalt, manufactured in the USA. The weight of the item is 55 pounds. The Dimensions of the products is 24 x 15.2 x 18.5 inches. It comes in yellow and black color. The product does not work through a battery. This multi-purpose chopping saw by Dewalt is suitable for cutting almost all the metals and other solid materials like wood or plastic. Dewalt DW872 has a carbide-tipped blade which ensures the thickness of the cut to remain constant until the time the blade remains in workable condition. A length of this saw blade is 14 inches. This saw can produce the most precise cuts with zero burring, and hence are faster and easy to handle. This Saw is known to be 4 times quicker than chop saws and band saws and can work quite faster in 2×2 inch 1.25-inch angle iron. 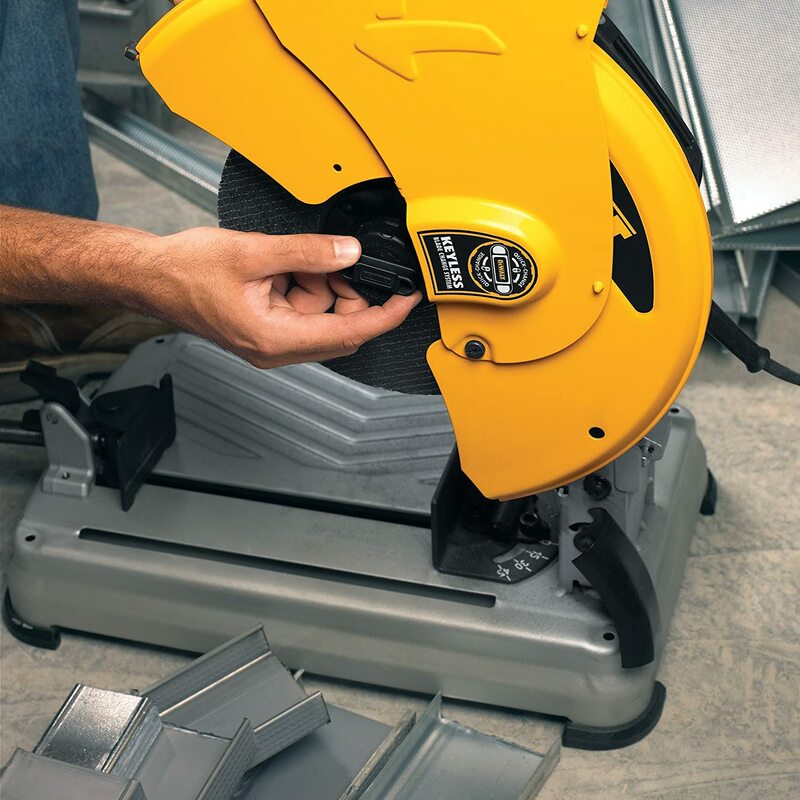 Cutting through of the Dewalt multi-cutter saw is relatively cheaper than abrasive wheel cutting. It possesses a powerful 15 ampere, with a horse-power of 5.3 motors. 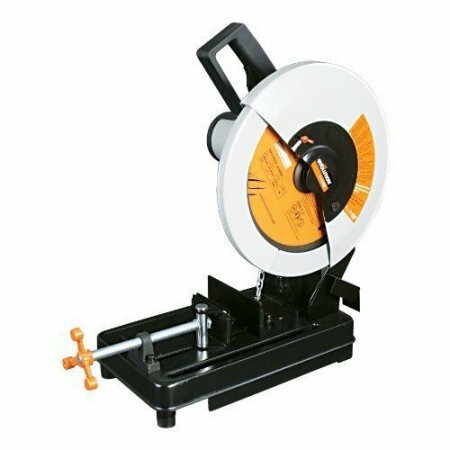 You can perform almost all your tough and rugged tasks using this cutter saw. The blade makes a uniform cut of 14 inches with its 70 tooth blade without any haywire penetration. It has a 1,300 RPM no-load speed. DW872 comes with a fence that elevates up to 45 degrees to make the machine cut angles particular pf sizes efficiently. Guard on the body of this machine is designed such that it retracts rapidly to view the cutting line, and at the same time helps in shielding from chips with a chip deflector. It helps to collect the debris in a particular direction and rotation. There is no need for any markings before you start your job as the carbide teeth can make just the right cuts in a uniform direction. Moreover, the cuts, once they are done are cool to touch. The carbide-tipped blade can make up to 1200 more cuts using an abrasive blade. For ensuring a comfortable grip over the machine, Dewart has added a vise for multiple kinds of usage. It is also given an easy a spindle lock for replacing the wheel of the machine quickly saving time between multiple applications. Also, it comes with a built-in wheel change wrench to reduce the misplacement of the wheels. Moreover, it has a handy brush for easy maintenance of the tool, and a perpendicular clamping system. The broad steel base of the product is given 4 pre-drilled holes for bolting purpose. There is a 3 year warranty provided along with this product and also a 1 year service contract for free replacement of parts worn out by normal usage. The product box contains a multi-cutter saw; 14-inch carbide-tipped blade, a vertical clamp and a wrench. Other than a parallel handle which ensures ease of use, a chainless lock for the saw head, the device also has a metal top handle for convenient handling while transportation. Along with this, it has a compression spring for uniform motion which is better than torsion springs used in many other chop saws. Makita is a known brand for quality power tools and industrial accessories. The model number of this product is LC1230 and weight of the item is 41.9 pounds. Dimensions of the products are 20.3 x 12.1 x 23.7 inches. It came in blue color and made of carbide. Makita LC1230t does not work through a battery and is a corded electric model, and it requires 120 volts and it has a 1650 watt motor. The no-load speed of the product is 1300 rpm. This product is suitable to easily glide through metal pipes, tubes or conduits, make iron angles, and cut through channel, better than any other abrasive cut-off saws. It also has a powerful 15-ampere motor which consumes a power of about 120 volts. There is a comfortable D-shaped handle for easy gripping. The 12-inch blade of the machine is made of long lasting carbide which ensures cost efficient operations. Moreover, it ensures accurate cuttings for long periods of time despite wear and tear. LC1230 motor works perfectly burr-free. It also has an easy lock-off button. The ‘tool-less’ guide plate adjusts up to 45° for easier customized cutting. Makita LC1230 has an absolutely smooth vise function for repeated cut-off tasks. Most of the cases, wrench can be stored on the cast aluminum base plate for frequent blade changes and shaft lock. Debris collection tray also comes along with it for easy waste disposal. Maximum cutting depth of LC1230 which can be achieved through this product is 4-1/2″. The arbor is 1″ in length and the maximum cutting capacities of this product are 4-1/2″ and 3-1/2″ at 90 and 45 degrees respectively. 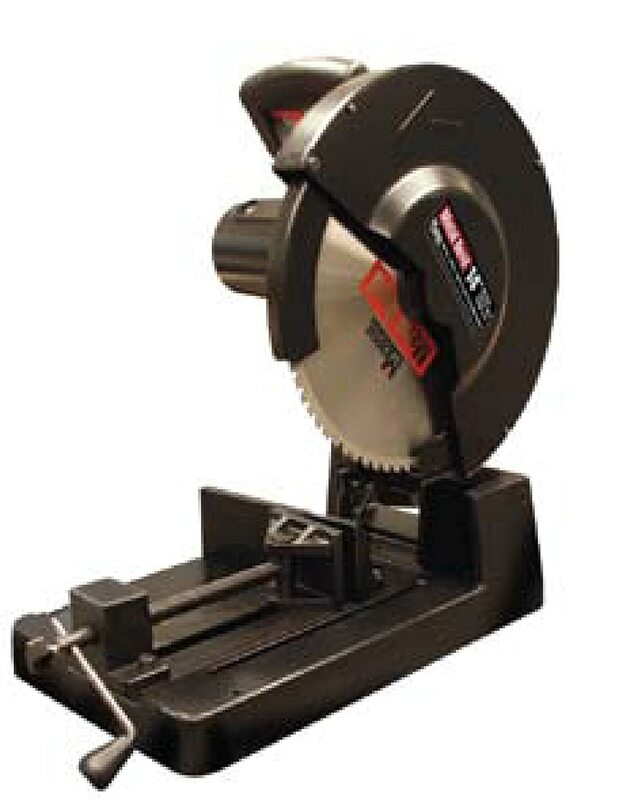 For all your pipe fitting work and framing needs, the MK Morse dry cut metal saw works best. It is a must have at construction sites and all such industrial needs. The model number of this product is CSM14MB. The weight of the item is 53 pounds. The dimensions of the products is 22 x 18.5 x 14 inches. blade size of this cutting saw is 14 inches and it is a non-battery corded-electric model. The product requires a voltage of 120 volts and no load capacity of the motor is 1300 rpm and it’s a high-torque low-speed motor. MK Morse CSM14MB has a dry cut 14 inches metal cutting saw which can perform multiple jobs of chopping metal bars, angle iron, pipes, tubes and conduits. The 72 tooth blade, made of carbide works without any flying sparks or noise. The product box comes with a metal steel cutting blade, safety guard, 6 and 8-mm hex wrenches for easy blade change, a vice, safety goggles, and ear plugs. MK Morse CSM14MB a Retractable blade guard and Plexi-glass safety shield. As well as, diameter of the Arbor is 1 inches. There isn’t any undue heat build-up in the machine while it is under operation. Cutting capacity of a 6.25 inch thick steel rod is around 12 seconds. Inner steel plate of the product is made of tungsten and titanium carbide. MK Morse CSM14MB has a MC, ISO9002 certification, and is also CSA safety certified. 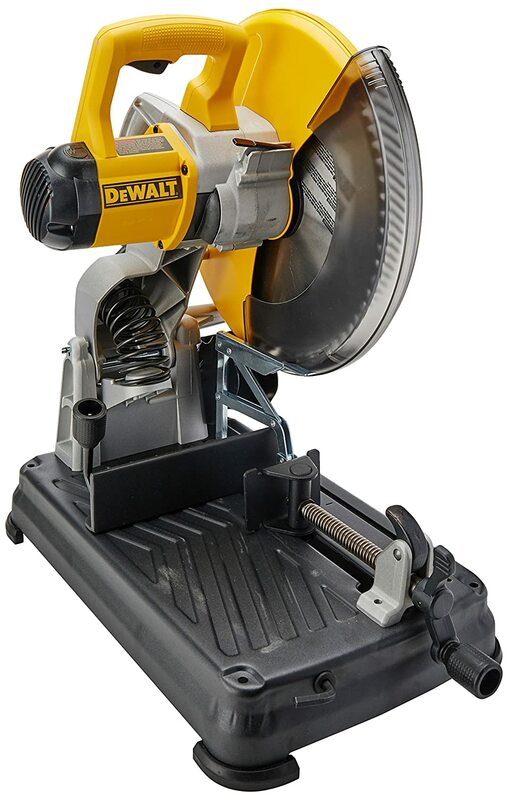 Our last metal chop saw on this list is DEWALT D28715 . Dewalt is an outstanding manufacturer of hand-held tools like hand saws and chop saws. The model number of this product is D28715 and is a Chinese manufactured product. Weight of the item is 46.2 pounds. and dimensions of the products are 22.5 x 16.5 x 14 inches and it comes in yellow color. It does not work on battery, it being a corded-electric model. The voltage requirement of the product is 120 volts. It comes in both plastic and metal body. The 15-ampere motor has a horse-power of 5.5, helps in overloading capacity and making swift cuts. DEWALT D28715 has a quick change blade mechanism that helps in changing bladed without using a wrench and no load capacity of the machine is 4000 rpm. This chop saw is ideal for quick and accurate angular cuts. and the instant-lock Vise lets you work on the task efficiently. Other than the quick wheel change feature, this product has an ergonomic and portable design ideal to be used on a go. This ensures longer duration tasks performed with minimum fatigue and greater efficiency. DEWALT D28715 comes with a 90-day money back guarantee, 3-year limited warranty, with a 1 Year service contract for free. If you are looking for square accurate angular cuts, Dewalt is the name for you. A 45-degree angle fence helps to make angular cuts swiftly and with precision. The compression spring used in this Dewalt product provides increased durability as compared to torsion springs. The spark guard of the tool is adjustable and directs spark to the desired area while working. Also, its sturdy lock-down pin helps to lock the saw head to avoid accidents while holding it from one place to other. The product box comprises of a 14-inch Chop Saw and an abrasive wheel, with a wrench, and a tool-free flange system. To purchase, any kind of technical gadget, there is nothing termed as a good or a bad product, the trick is first to identify which is the purpose for which you will be using it for. There are different types of metal saws blades required for different kinds of sawing jobs like steel, aluminium, and other metals. You need to specific in your purpose before actually going out into the market, because otherwise you tend to get confused by the enormous variety available in the market. You should also consider the time period of its usage keeping into consideration heavy wear and tear of such power tools. If your purpose to buy is a minor carpentry job or a DIY project at home, the basic variety of metal chop saw should suffice. However, you want to use it for regular industrial usage, then you would definitely need a heavy duty chop saw. It is always better to buy those models which come with safety glasses, and a hearing guard for the safety of the user. Also, the noise level produced while operation should be adhered to. Also, since the job involves a lot of dust and debris, it is also advisable to wear dust mask and gloves to avoid flying metal splinters from harming the hands of the user. The Metal chop saw should have a minimum of sparks and heat build-up. The metal chop saw typically comes with a spring-loaded pivot arm, joined to a metal table with an angular plate, and a vise or a clamp assembly to hold the metal on to it. The chop saw must have a spark deflector which automatically covers the blade while chopping to stop the sparks from flying away. This is required for doing metal jobs. Most metal choppers come with 8, 10, or 12 inch blades. The additional teeth on the metal chop saw gets you a finer cut work. In extreme spaces, where lighting is less, you are recommended to buy modern day chop saws which come with lights enabled. There are also the built-in laser lines which marks a red line to draw a line over which you can cut easily. These reduces the unnecessary effort of spotting and marking. There are adjustable fences, clamps and extension arms to extend the chop saw. You can also alternate the speed of the motor with the variable speed feature. You should choose the right blade diameter for your job type. Also, you can consider buying a chop saw stand for mounting the saw over a surface. These stands come with roller carriers, clamps, supports, and have adjustable legs. These ensure minimum possible fatigue to the worker. You might also want to use a vaccuum cleaner along with a metal chop saw to reduce saw-dust particles in the air. Is a Chop saw and Miter saw the same thing? Both Chop Saw and Miter Saw are great tools and important to have for a workshop. Also, they look alike. However, there are a few differences. A Chop Saw is used to saw a fixed angle of 45 degrees and is used to cut in an up and down motion. But it has a very strong base and has the ability to cut through tough materials like various metals. At the same time, a Miter Saw can be used to saw at a 90 degrees’ angle. It is made possible because it has a saw in a circular shape attached on a frame. Thus, it gives the added advantage of rotating the blade at a wider range. As mentioned earlier, a Chop Saw is used for sawing through rigid substances like steel and metals etc. It comes with a strong base where the material to be chopped can be easily held. This gives it the ability to penetrate through such hard substances. A Chop Saw enables unidirectional cutting which is not the case with its counterpart Miter Saw. Modern day Chop Saws have a lot of specifications that only a professional worker can understand. So before you go out in the market and search for the piece best suitable to you, you might want to take help from this article. Here, we have tried to cover almost all the aspects that would have an effect on your choice of the metal chop saw.